When it comes to skin cancer prevention and detection, your back should be at the front of your mind. While it’s a hard area of the body to protect with sunscreen, it’s also an important one, as the back is the most common location for melanoma, the deadliest form of skin cancer. Research also has shown that thicker melanomas, which can require more advanced treatment, are more frequently found on parts of the body that can’t easily be self-inspected, like the back. 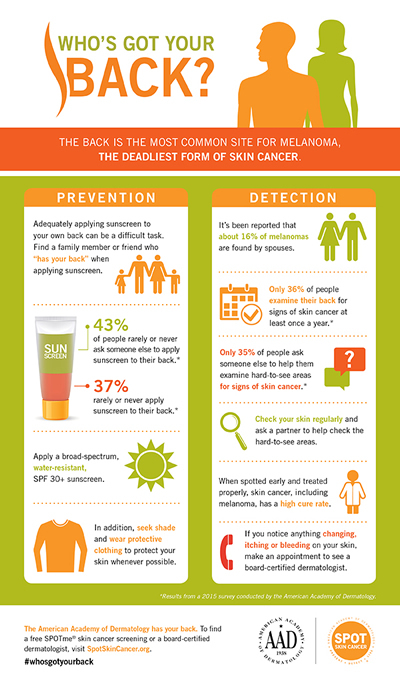 In recognition of Melanoma/Skin Cancer Detection and Prevention Month® in May, the American Academy of Dermatology (Academy) asks the public to consider “Who’s Got Your Back?” when it comes to applying sunscreen and examining skin for suspicious spots. According to a 2015 online survey conducted by the Academy, 37 percent of people rarely or never apply sunscreen to their back when it’s exposed to the sun, and 43 percent rarely or never ask someone else to help them apply sunscreen to their back. Men are more likely than women to rarely or never apply sunscreen to their back (40 percent versus 33 percent, respectively) and to rarely or never ask someone else for help (47 percent versus 40 percent, respectively). According to the survey, men are twice as likely as women to report that they wouldn’t feel comfortable asking anyone to apply sunscreen to their back (10 percent versus 5 percent, respectively). If no one else were around to provide help with sunscreen, 14 percent of survey respondents would not take any action, like seeking shade or wearing protective clothing, to shield their back from the sun. To emphasize the importance of sun protection on the back, the Academy released a “Who’s Got Your Back?” video. Once you’ve found a partner for skin cancer prevention, it’s time to consider who’s got your back when it comes to skin cancer detection. Skin cancer is highly curable when detected early and treated properly, so it’s important to check your skin for suspicious spots. According to the Academy’s survey, 51 percent of men and 35 percent of women don’t know how to examine their skin for signs of skin cancer. Only half of respondents said they perform skin self-exams at least once a year. The survey indicates that people are less vigilant about checking their back than the rest of their skin. Just 36 percent of survey respondents said they examine their back for signs of skin cancer at least once a year, and only 35 percent ask someone else to help them inspect hard-to-see areas.